If you’ve been trying to buy your first crochet hook and felt overwhelmed with the rows and rows of hooks at your local craft store, you know how difficult this simple task may become. 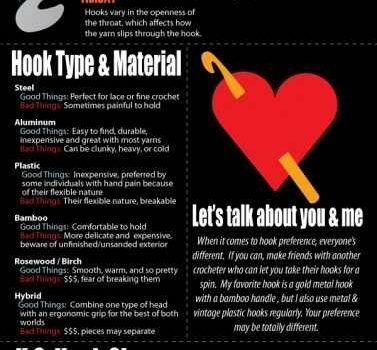 This simple info graphic makes it really easy for you to figure out how to choose your first crochet hook. How To Buy Your First Crochet Hook guide for beginners, courtesy of Hi! Jenny Brown can be downloaded as a PDF so you can zoom in on and study before your trip to the craft store. Thanks to Jenny Brown for the article inspiration and featured image. Wow! I wish I had this when I was talking to the lady at JoAnn Fabrics in Washington, Missoiri a few weeks back. She was determined to teach herself how to crochet but clearly overwhelmed by the hook selections. I believe I covered most of the points on here, but what a handy guide! I’m downloading this to have in my phone for future reference. THANKS! I wonder if that lady ever finished her first dish cloth. I hope she found a class or meet-up group and is on her way to crocheting fabulous things!